I just got a “(extlink)T-Mobile”:http://www.tmobile.com camera-phone (a Sony-Ericcson T610 to be exact) so I’ve been snapping some photos here and there. Here are some I took tonight under the snow. 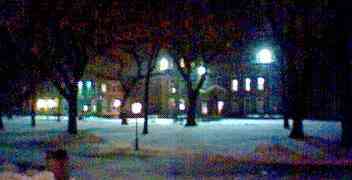 Milledoler Hall and the rest of Voorhees Mall covered in snow.